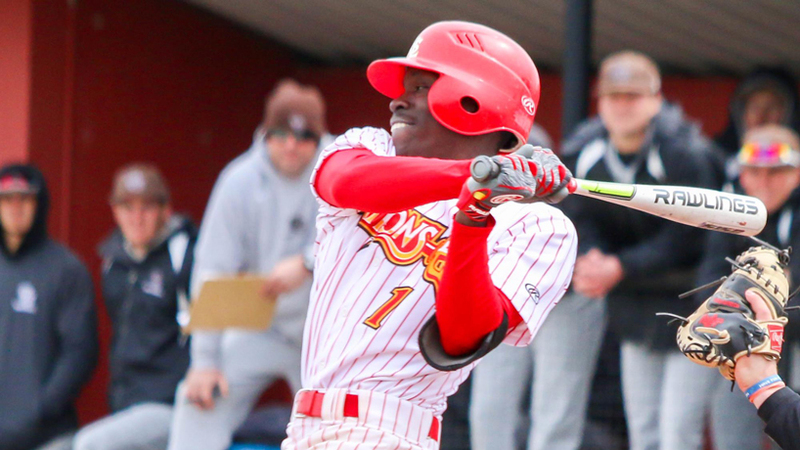 Junior Derrick Freeman’s hitting helped power UMSL to a 4-1 week. The Tritons center fielder recorded a .526 batting average, including three doubles and two triples, to go along with 10 RBI and seven runs. UMSL went 4-1 last week, which included a 13-11 win at Lindenwood on Tuesday and two wins in three games against Bellarmine over the weekend. The Tritons began the week with a 5-4 win over Lewis. Redshirt junior Derrick Freeman batted .526 over the five games, recording 10 hits, which included three doubles and two triples, for an .895 slugging percentage. He also drew three walks, including two intentional, and finished with 10 RBI and seven runs scored. UMSL (4-13, 3-3 Great Lakes Valley Conference) will host McKendree on Wednesday in a conference doubleheader before traveling to Quincy on Saturday and Sunday for a three-game league series. The Tritons posted a 3-3 record last week, sweeping Washburn, falling twice to Lewis to open GLVC play and splitting with No. 24 Indianapolis. Senior Chelsea Martinez led UMSL with a .556 batting average, recording 10 hits, including four doubles, a triple and a home run. The Tritons (12-14, 1-3 GLVC) will host Bellarmine and Southern Indiana on Saturday and Sunday, respectively. UMSL won all three matches in Hilton Head, South Carolina, last week. Senior Rob White, junior Ben-Hur Kasprzak and sophomore Karl Heinrichs all went 3-0 in singles, while Heinrichs also won all three of his doubles matches. The Tritons (6-3) are at Lindenwood on Tuesday before opening conference play at Maryville on Saturday. UMSL won all three matches in Hilton Head, South Carolina, last week. Junior Marina Prediger went a combined 6-0 in singles and doubles, teaming with sophomore Leticia Lunge in doubles. Lunge also won both of her singles matches.